This collection presents beautifully crafted urban anti-facades, both interiors and exteriors, which explore the tension between the construction and anonymisation of human spaces. It provides the opportunity to consider how, in our ongoing de/personalisation of spaces they are de/humanised over time. While none of these pieces contain people, until we stand in front of them, all represent human spaces either in the process of construction or de-construction, representing the broad spectrum from personal to impersonal. There is nothing that suggests the personal more than a fireplace – and nothing more anonymous than the gable end of an urban building, its macro space distinguished by micro features barely suggestive of the people behind. In some works presented here, these human spaces are placed at the periphery, effectively forcing us as viewers to lean in against the gallery wall in order to look inside. In doing so we squeeze ourselves into a marginal space of personal experience, leaving the central gallery as the anonymous platform from which one begins to look, and begin our reflexive journey into how we more generally occupy liminal places of contemplation, or habitation. Through their location on the wall, these pieces also engage us in other conceptions of space which disrupt and unsettle our taken for granted notions about our place in the world, and quite literally too. For example, Hoarding forces us out into the suggested road, from which we view not only the piece, but the space above it, an immanent horizon not yet constructed. In this way we are offered the opportunity to build in our own expectations of what the construction might become, and in doing so begin to engage with ideas of futurity. Hearth, Night and Day, and the other pieces in this particular strand of the exhibition, disrupt our sense of place even further with the dangling lamps that emphasize the lack of floor. We have to ask where we stand when viewing these pieces and discover that our position becomes one that is suspended in place. Our resulting sense of unease is exacerbated by a tension generated through an almost irreconcilable sympathy with the perfection of the work and the ambiguity in which it situates us. Not only do we lack a floor to stand on, but the fire is unlit, the curtains are undrawn; we are witnessing a moment that has either passed, or not yet arrived – in effect, we are also suspended in time. Time plays out multiply throughout the exhibition, geologically as in Hoarding, historically as in the erased graffiti in Peripheral Vision #4, both comprising the times we inhabit and through which we pass unconsciously, and the sort of dot-dash of every day timings suggested by traffic lights. Nevertheless, this exhibition generates a sense of fundamental stillness. Because the human moments in the spaces presented are either finished or yet to happen, we are permitted a suspended free-fall – a timeless moment in which to consider. It is at this intersection of time and place that our own biographies come vitally into play while the title of the exhibition situates us in a broader, more profound historical context from which to start our contemplation. In finding our balance, deciding where we stand, deciding on the moment we occupy, this exhibition engages us with how we reclaim our humanity through our every day striving to establish our place in the world. Born in Whitstable and brought up in Newcastle, British sculptor Steve Johnson moved to London in 1974 where he continues to live and work. He was educated by Michael Craig-Martin, Tim Head and Richard Wentworth at Goldsmiths College as an undergraduate fine artist and by Richard Deacon at Chelsea College of Art as a post graduate sculptor. He has received awards from amongst others, the Arts Council England, the British Council and the Pollock-Krasner Foundation, New York and his works can be found in public collections including those of the Arts Council England, the Berlinische Galerie Landesmuseum, Berlin and the Science Museum, London. Johnson’s work renders the built environment subjectively. He has always been interested in architecture transcending its traditional ‘subordinate’ role in visual art as a setting, backdrop or context. In his work, architecture becomes the player and not just the stage. 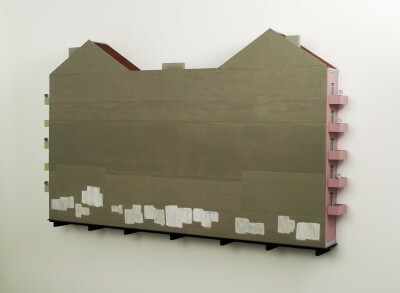 He has used architecture as metaphor and oblique symbol throughout his career. His recent works hover between painting, relief sculpture and installation and somewhere between concrete reality and state of mind.